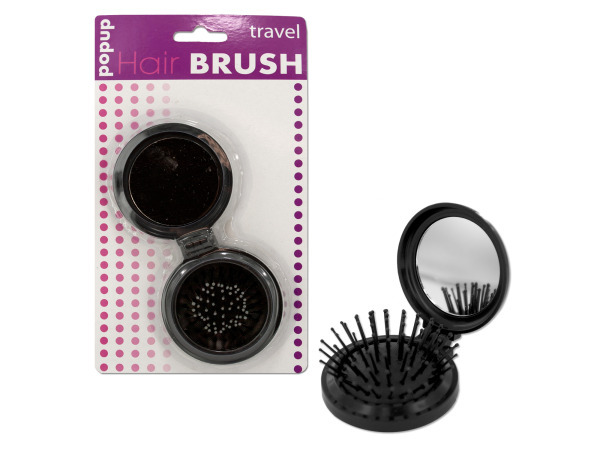 Perfect for travel or to keep inside purses and drawers for touch-ups on the go, this chic and unique compact opens with a standard view mirror on one side and a pop-up brush on the other. Just open, press bottom of compact and bristles will pop up. To retract simply press bristles until they snap back into place. Brush is available in black only. Comes packaged on a blister card with and has an interactive package design for preview of pop-up feature. Measures approximately 2 1/2" in diameter, and nearly 3/4" thick with 1/2" bristles.